Even before it was announced that Rdio was in financial trouble, and even before we learned that Pandora was buying parts of Rdio to shut it down, I wondered if I should move to a different music streaming service. I enjoy Rdio, but I couldn't shake the nagging feeling that I had backed the wrong horse and eventually my hard work on playlists would vanish. Because of this, I was reluctant to spend too much time creating and fine tuning my Rdio playlists. 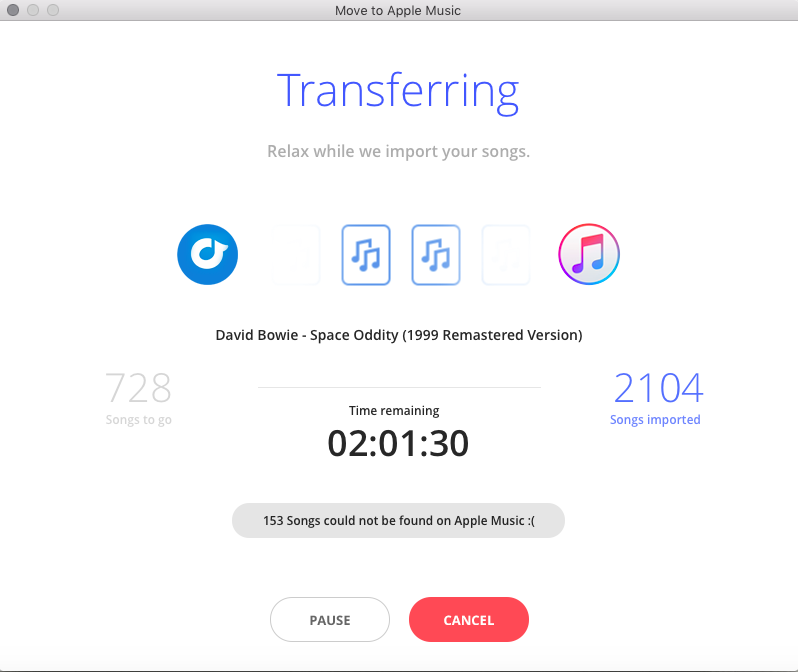 Fortunately, there's a solution, I successfully used Move to Apple Music to copy my playlists into my free trial of Apple Music--I still haven't decided if Apple's service is the way to go. This playlist migration from Rdio to Apple Music cost me $4.99 and it was well worth it. I used an old MacBook for the playlist migration and it took about 12-16 hours. Yes, that's right about 16 hours. During that time, I couldn't use the machine for much because it was tying up the internet connection. I had about 2800 songs because it counts Rdio's "My collection" as a playlist. Move to Apple Music allowed me to export a copy of my playlists (in XML), then upload the playlists I want into Apple Music. It also provides a list of the songs it couldn't find on Apple Music. In my case it was over 200, but when I checked into it, it turned out that most of the songs are available on Apple Music, they're just listed differently (e.g., the same song on a different album version). Be aware, iTunes will actually refuse to sync a playlist if there's a song included that can't be found, so you'll have to check them once you have finished the import. Note that I did try the free version of STAMP, which copies playlists from Rdio, Google Music, or Spotify to Apply Music or Spotify. I couldn't get STAMP to work and it required move work to run than Move to Apple Music. It also costs a few bucks more. Update: After the import, I noticed a lot of the songs are not the album version. I haven't tested this theory, but I think I know why it's happening. When a live version, or a remix of a song is available, it's a common format to add "(live...)" or "(...remix)" to the song title. I believe the open bracket results in these versions appearing first in the Apple Music API search results. The upshot is you'll need to go and switch the versions if you're not a fan of live versions and remixes.